Recalling the ceremonial launching of the ‘dgħajsa tal-pass’ in Birgu, when the boat would attract the admiration, and sometimes, criticism of people walking around it, Mewweġ enters a dialogue with the passing of time. Mewweġ, an interactive installation by Enriquè Tabone, inspired by the concept of the cradle will be at Couvre Port as part of Birgufest 2014, from Friday 10th to Sunday 12th October. Addressing a press conference earlier this week in Birgu, Valletta 2018 Foundation Chairman Jason Micallef said: “Valletta 2018 is not just about activity within the city but also about seeing small-scale activities take shape across the islands and among community groups. Valletta 2018 is playing a pivotal role in the fostering of talent and ideas”. Birgu has served as the backdrop for a number of Valletta 2018 events including ‘Qatt ma Ninsa – Life at Sea’ at the Maritime Museum, in June and the performance inspired by the same event ‘Qatt ma Ninsa – Birgu’ by Teatru Manoel Youth Theatre, last month. Enriquè Tabone’s art is inspired by experimentation with a wide range of materials and media. The artist sees herself as an extension of the medium she is working with and vice versa. She intervenes in the material, developing an understanding of what it can do and the media it may be applied to. She uses this creative process to express feelings as well as evoke thought in the audience. 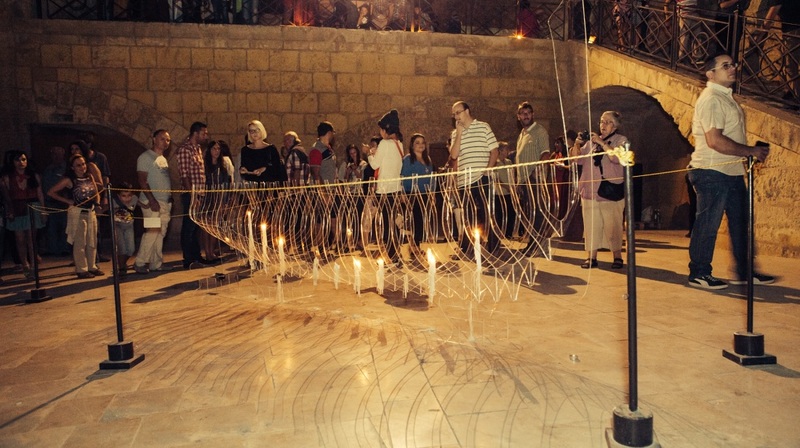 The installation, commissioned by Valletta 2018, was created using translucent perspex and candles whereby candleight is reflected by the material. A torque motor creates a continuous motion to the installation. Almost 40 pieces make up the installation with each of these fitting into each other like a jigsaw puzzle. A press fit technique was used in the assembly of Mewweġ. Recalling the ceremonial launching of the ‘dgħajsa tal-pass’ in Birgu, when the boat would attract the admiration, and sometimes, criticism of people walking around it, Mewweġ enters a dialogue with the passing of time. It distils the delicacy of the framework and transforms it into a movement suggesting, possibly, hope. It invites us to experience it in our own way and weave our own stories around it, seeing it with its play of light and shadow but also beyond that which can be captured by the naked eye.